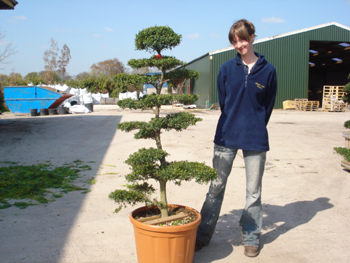 Bonsai Cloud Trees originate from Japan and are a labour of love. They make an extremely special focal point and their unusual cloud like structure is perfect for anyone looking for something different. To create this interesting appearance, the plants are pruned to reveal the stems and then any remaining foliage is trimmed into a neat cloud shape. These trees do need a fair amoung of taking care of as they require regular watering and careful pruning; this is best done in the Autumn. Bonsai trees are some of the oldest and most expensive trees in the world and can, with the right care and attention live indefinitely.